Scent: Perhaps it's because we had steamed asparagus a few nights ago at dinner, but that's the first scent that came to mind! Flavor: OK, you're going to think I'm weird(er), but this tea had *such* a rich taste, it reminded me of ... broth! I was sipping away and thinking how this was obviously just clear liquid, but it had a richness that made me think of the broth in chicken noodle soup. No chicken taste, mind you, just the fullness of the broth. I greatly enjoyed this tea! 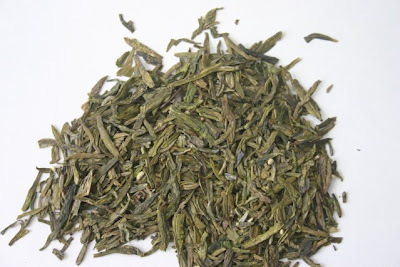 Additional notes: Michael Harney in The Harney & Sons Guide to Tea says that while most of the Chinese green teas in his book are handmade teas, Huangshan is "one of the few made almost entirely by machines." He also notes that the handmade version of this tea is so rare, it has become a popular gift among businessmen. Interesting! "Tea is one of the most social and popular events of the day and the taste and refinement of the hostess are readily recognized in the manner in which it is served. Everything should be as dainty and attractive as possible. 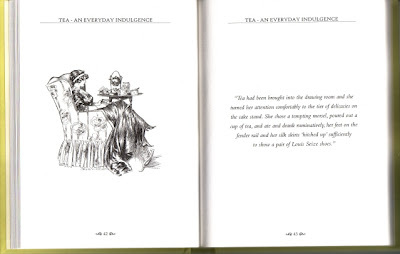 The tea itself should be of the best that can be afforded and must be well made..."
From the clearance table at Anthropologie comes this 2007 book from Copper Beech Publishing in Great Britain, "Tea an Everyday Indulgence." 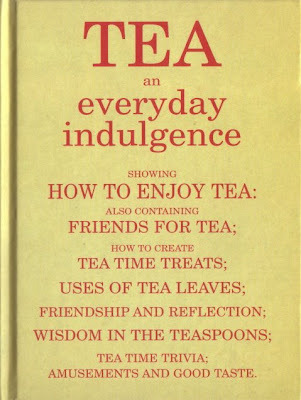 Although it doesn't exactly say so, I am assuming this book is a compilation of the tea and etiquette advice from vintage publications. A discussion of which foods may be eaten with one's gloves on, for instance, seems quite quaint today, but it's still fun to read. And it's been a while since I've dressed like the lady in this illustration at dinnertime! A quick and easy read, this small book included quite a few tidbits I've never heard before. On teaspoons: "Up to the time of Waterloo, teaspoons were adjusted chiefly to the calibre of female mouths." Another fun fact: "The scalloped shell which appears on so many tea spoons originates from the time oriental merchants placed a real scallop shell in the tea chests so customers could inspect it before making their decision to buy." There are also a few simple recipes in the book, but the social customs and courtesies are what I most enjoyed reading. Years ago, I went to Savannah to visit my dear friend (and fellow journalist) Kathy. We were in a T.J. Maxx when I came across some gorgeous sheets (Shabby Chic, maybe? ), and Kathy walked up as I was digging through the pile. She asked if I was looking for a certain size, and I explained that yes, I wondered if they had them in "Full" size, even though I wasn't even sure I wanted them. I just needed to know they had them in that size in case I *did* decide I wanted them. She got this look of fierce determination in her eyes and said, "Oh, I understand completely!" So we set to clearing sheets off shelves, and soon she pulled out a package marked "Full." Although I didn't buy them, we both left the store feeling quite good about it all. Can you imagine a man understanding that little scenario? I can't. I remembered that long-ago incident when I was in Michaels this week and came across some really pretty initial journals in one of the $1 bins. What did I do? I looked for my initial, of course! I set to digging through all those "V" journals (I think they are a little overstocked on the "V" ones), and quite a few "N" ones, and even some "S" ones, and finally I found an "M" one! 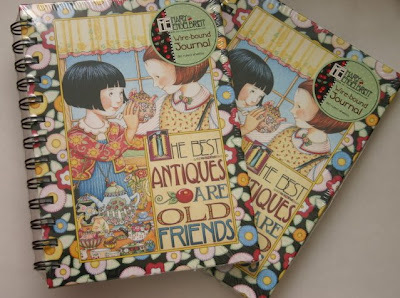 But I didn't really *need* one of these journals, even for $1, so I left it, but I thought of my friend Kathy, who I'm sure would have understood my "need" to dig around for something I wasn't going to buy. Happily, though, I found something else in the $1 bins that was indeed needed. I'm totally out of blank tea-themed journals (I used to have several of them waiting to be filled), and I really like this sweet Mary Engelbreit design with teapots and the saying "The best antiques are old friends." I certainly can't quibble with the price. If you're out of journals as well, it might be time for a quick run to Michaels. And wouldn't these be cute tea party favors? So where do you stand on sweeteners in your tea? Love 'em? Hate 'em? I drink the vast majority of my tea plain, whether it's a fruity flavored black tea or one of the pure teas I'm "tea tasting" this year. Every once in a while, though, and especially at tea parties, I like to enjoy a little something sweet in my teacup. 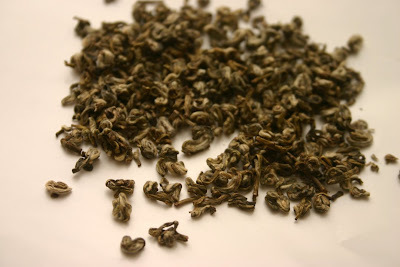 A new choice for tea lovers: Honey Pearls from White Lion Tea. I received a sample of the Honey Pearls at a trade show recently, and then the company kindly sent some more to the office. I added a packet to a cup of my beloved Emperor's Bride Tea from The Tea Room in Savannah, and it was just the right amount of sweetness. 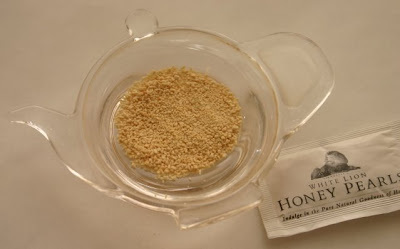 Honey Pearls are made of all natural crystallized honey, and I'll be ordering some of these for my tea table. You can order a jar of them loose (which I think I'd prefer), but if you're someone who often travels with your sweetener you might like the packets. The single packets I've enjoyed are just 2.8 grams of sugar and 12 calories apiece. 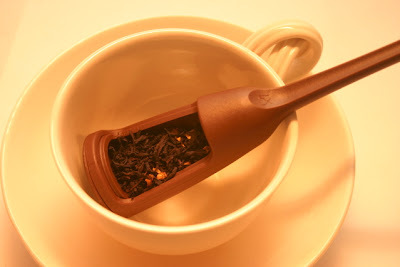 For a once-in-a-while treat, I think this is an elegant new way to sweeten tea! Months ago, I saw this Tupperware tea infuser listed on eBay, but it apparently hadn't made it to the U.S. yet because its "home" was somewhere like Hong Kong, as I recall, and I didn't want to take a chance on ordering from so far away. So imagine my surprise when my friend Deberah just waltzed up to me at work one day recently and handed this to me. I haven't had a Tupperware lady in years, so I was thrilled that my friend is Tupperware connected enough to have located this infuser for me. It has an interesting design, kind of like those ballpoint pens you don't click but instead rotate the barrel to reveal the pen. 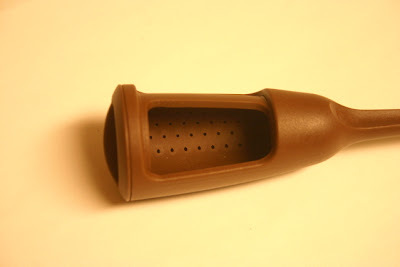 On this infuser, you rotate the barrel to open it for filling with tea and then close it. And the infuser will stand up when you're through infusing the tea. So does it work? Well, I have to confess I'm as surprised as anyone to say ... YES, it does! 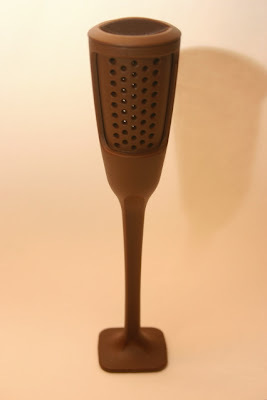 Now I will test any infuser on the market, but I am accustomed to about 99 percent of them not working worth squat. My tea leaves filtered beautifully with this infuser, and there was nothing but infused tea in my teacup! When you're through, you stand this little baby upright and it doesn't drip. I do not-not-not understand this. I just knew this was going to be a dribbler for sure. So all I can say is, Tupperware rocks! Looking for an easy three-layer cake to make for your next teatime? After experimenting with a new recipe in honor of my daddy's 70th (!) 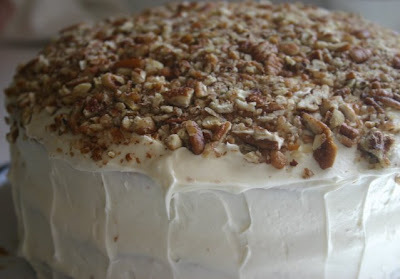 birthday yesterday, I am happy to be able to recommend this easy Hummingbird Cake. I've had this particular recipe sitting around in my recipe clip file for years, but I don't have occasion to make that many "fancy" cakes. Since my sister was cooking supper for everyone yesterday, I volunteered to bake the cake and was pleasantly surprised at how easy this one was to make. Now some of you are no doubt saying "Hummingbird cake? Humph. That's no big deal." And you would be right. It's apparently been around for a few decades now, but hey, it's new to me! 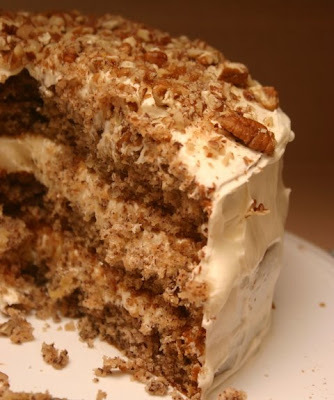 I love the combination of pineapple, bananas and pecans, and of course that fabulous cream cheese frosting. But why on earth do they call this thing "Hummingbird Cake" when there are (happily for the hummingbirds) no hummingbirds in it? A little research reveals two schools of thought on the matter. 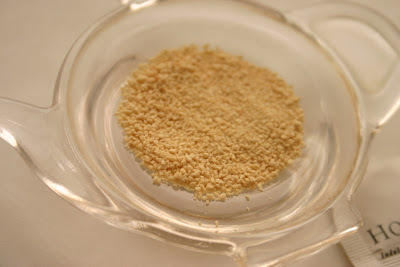 1) Foodtimeline.org says that "recent evidence suggests this confection descended from Jamaican roots. The hummingbird (aka Dr. Bird) is one of the national symbols." So that theory postulates that the cake is named in honor of a particular Jamaican hummingbird. 2) The second theory, and the one I like best, is southern and sweeter. This theory says that just as a hummingbird is attracted to sweet nectar, so is the southerner attracted to this super sweet cake which first appeared in Southern Living magazine in 1978. Preheat oven to 350 degrees. Grease and flour three (9-inch) round cake pans and set aside. Combine flour, sugar, baking soda, cinnamon and salt and stir until combined. Add eggs and oil, stirring just until the dry ingredients are moistened. Add vanilla, pineapple and juice, bananas and 1 cup of the pecans and mix. Divide among the prepared pans. Bake until a toothpick inserted in center of the cakes comes out clean, about 25 to 30 minutes. Let the cakes cool in the pans for about 10 minutes, then turn onto racks to cool completely. Frosting: With electric mixer, blend cream cheese and butter or margarine until well combined. Slowly add confectioners sugar and beat until light and fluffy, then add vanilla and salt. Generously spread the frosting between the layers. Ice top and sides of cake, and sprinkle remaining pecans over the top. Makes 10 to 12 servings. "Dear Upton Tea Company, I'm afraid there's been a mistake. You see, I ordered some of your organic Lung Ching to use as part of my year of tea tasting. Alas, I opened the package and it became clear that one of your delivery trucks must have run over my tea leaves, because the poor dears were flat as a flitter. What can we do about this? Sincerely, Angela McRae." Fortunately, I didn't dash off the e-mail with my initial thoughts. 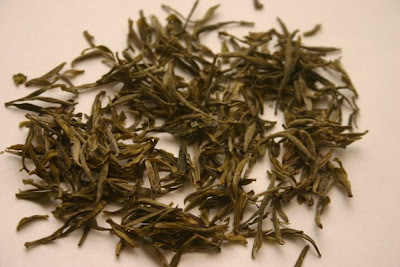 Turns out, Lung Ching is indeed comprised of flat leaves. Who knew? Dry leaf appearance: Flat, flat, flat. So flat I was worried at first! Wet leaf appearance: Chopped spinach looking. Sank to the bottom of the teapot. Scent: OK, I'm used to the vegetal scent by now, but this time the scent that most came to mind was boiled peanuts! Flavor: A very rich, full, green tea taste, with no bitterness, and only the teeniest bit of astringency -- which I didn't detect until the second cup. I could (and did) drink a lot of this tea. 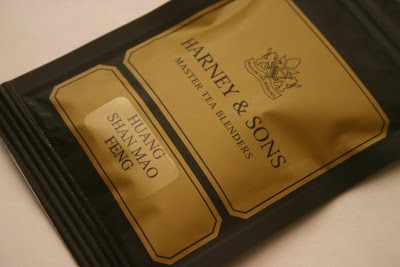 Additional notes: According to Michael Harney in The Harney & Sons Guide to Tea, "Lung Ching is to Chinese green teas what French Champagne is to sparkling white wines: the standard against which all others are measured." Well! Isn't that nice to know! Some of you will remember reading last fall about Pearl Teas, the company that had created tea blends in honor of both presidential candidates. 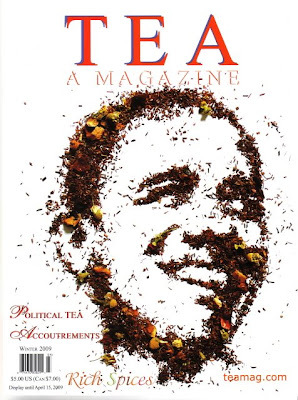 The company published illustrations of the candidates made of the respective teas, and so it is that the cover of the Winter 2009 issue of Tea A Magazine features Jack Cheng's illustration of President Barack Obama made from the Obama Presidential Blend. For those of us who are political junkies, this issue has lots of fun stuff related to both tea and politics. An article by Eve Hill shows several of the ceramic teapots designed in honor of heads of state, including George Washington, Ronald Reagan and Margaret Thatcher. Items from the collection of Editor Pearl Dexter include a teapot fashioned in the shape of the White House and a cup and saucer in President Andrew Jackson's pattern. There's also an article on pewter teapots that belonged to President and Mrs. Herbert Hoover. There are plenty of other pieces of interest - Jane Pettigrew's account of a trip to Malaysia's Highlands, various recipes using tea as an ingredient - but to me the political/presidential features make this issue a real keeper. The British artist Kate Greenaway (1846-1901) is someone I first got to know in the pages of the old Victoria magazine back when it was in the habit of shining a light on women artists and writers. 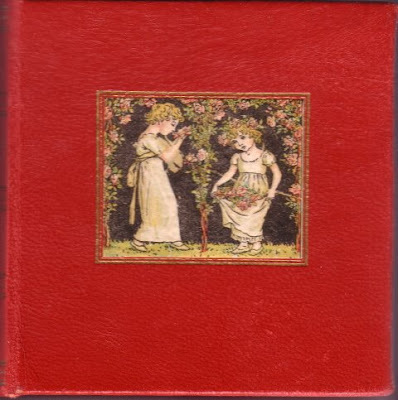 Greenaway's drawings were quite lovely, and when I got into crazy quilting in the early '90s and began to study the earliest examples, I learned that vintage crazy quilts would often incorporate a Kate Greenaway drawing as an embroidery motif. An inscription tells me the book was given as a gift for Christmas 1963, so it's at least that old, but I'm more impressed that the publisher is Frederick Warne and Co. If the name seems familiar, that may be because you've seen "Miss Potter" (which had lots of great tea scenes) and recall that this company published the Beatrix Potter books. 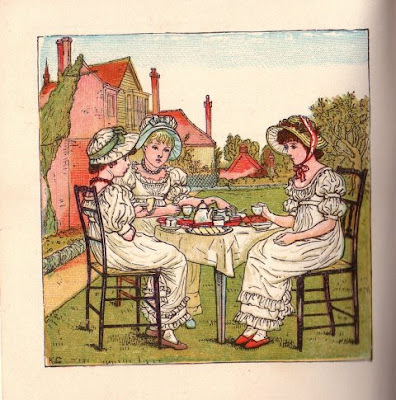 Beatrix Potter, Kate Greenaway ... it's so nice when the historic ladies I admire all seem to share a love for teatime! Finally! 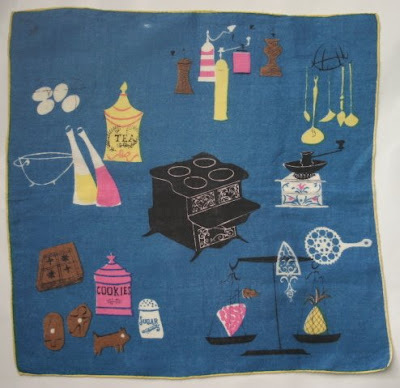 I always knew there *had* to be vintage handkerchiefs with tea stuff on them, I'd just never seen any. I was even at a trade show last month and mentioned this quest to a woman whose company reproduces vintage hankies. 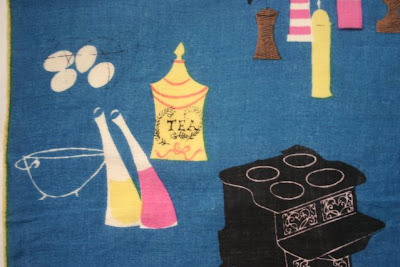 No, she said, she'd never seen a handkerchief with a teapot or teacup on it, but it would be a great idea, wouldn't it? An afternoon visit to Collector's Corner in Sharpsburg, and the booth of my friend Angie, of all things, turned up THREE! 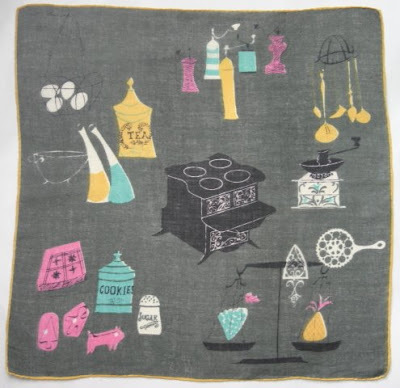 I always knew she and I like a lot of the same things, I just never knew she was such a collector of handkerchiefs. She has them very neatly displayed, and monogrammed ones are even in a notebook where you can flip through and find the initial you desire. 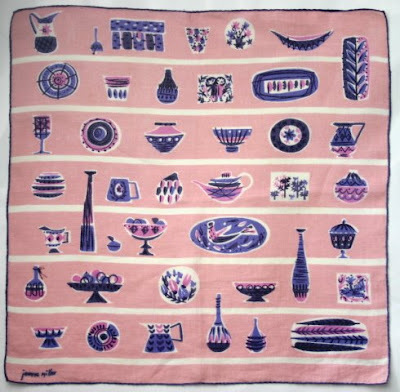 But I was of course attracted to the ones with tea images, like this pink one signed Jeanne Miller. And Pat Prichard is the designer of these dark gray and bright blue hankies. I got all three for a total of $10, and I plan to use them as "art" on my walls, perhaps in my sewing room. Do you like old hankies? If so, I'd love to hear about them! 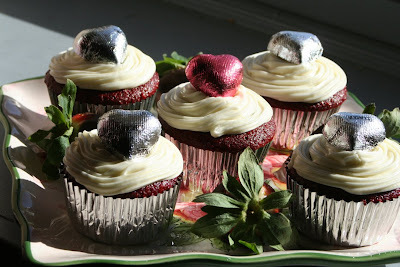 If you'll permit me one more day of Valentine reportage, I wanted to share two treats from girlfriends that I just loved! First, my friend Deberah, who recently hosted a beach-themed bridal shower, brought me a treat bag featuring the sand dollar punch she used (cute!) 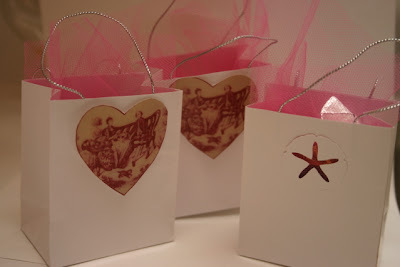 as well as some heart-decorated bags, all filled with chocolate. Does that heart design look familiar? 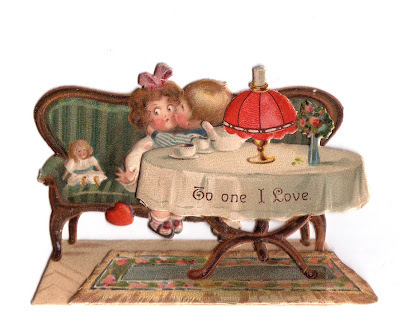 It should, because she "borrowed" it from that toile looking teacup I wrote about on Thursday! Isn't that a great idea? And my friend Susan, one of the local "baking queens" I am blessed to call a friend, dropped by the office with a beautiful plate of Red Velvet Cupcakes. 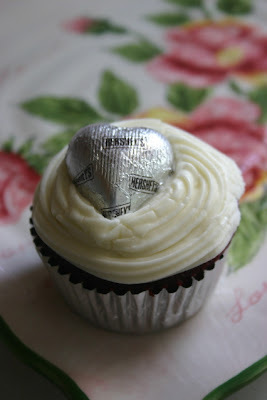 Now I just love cupcakes. The portions are just right, the shape is cute, and I thought her presentation of these was just so lovely, especially when accompanied by chocolate-covered strawberries! 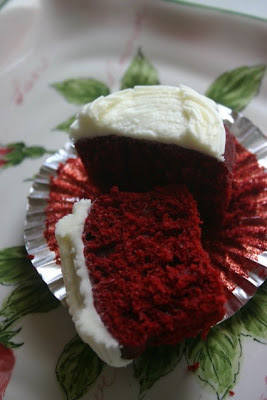 And yes, I shared a couple of the cupcakes, but this last one was mine. All mine. Except that I felt guilty and decided to share it with DH! So he got half, and I got half. Not a bad snack! So I had a weekend full of tea and treats and enjoyed every single bit (and bite) of it. 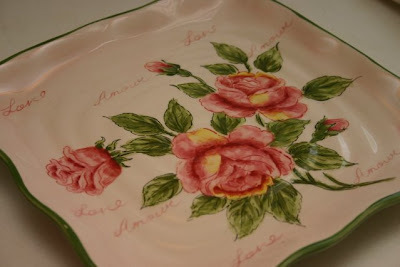 And a beautiful plate as a keepsake from Valentine's season 2009. Now, what are we going to be doing to celebrate St. Patrick's Day? 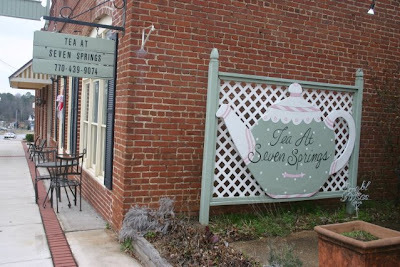 For the sixth year in a row, my sweetheart has treated me to afternoon tea for Valentine's Day, and this year we went to a totally new (to me) tearoom, Tea at Seven Springs in Powder Springs, Ga. My tea friend Beth had praised this tearoom after visiting, and now that I have been myself I see why she was so impressed. 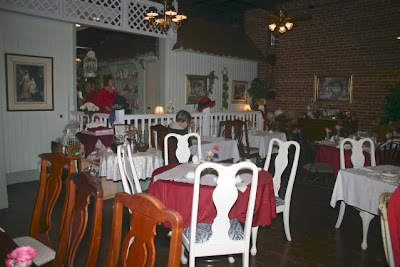 This is a tearoom that did everything right. We had a short wait and were soon seated by a gracious hostess. The atmosphere was quiet and soothing and there was pretty instrumental music playing in the background. About halfway through our tea, Alex said he believed the food was as good as we've ever had in a tearoom, and I had to agree with him. For our teas I selected the Earl Grey Supreme and he got the Darjeeling (from Harney & Sons, always a plus). Next came a teacup holding a serving of homemade vegetable soup (chunky and delicious) accompanied by a small cheddar cheese biscuit. 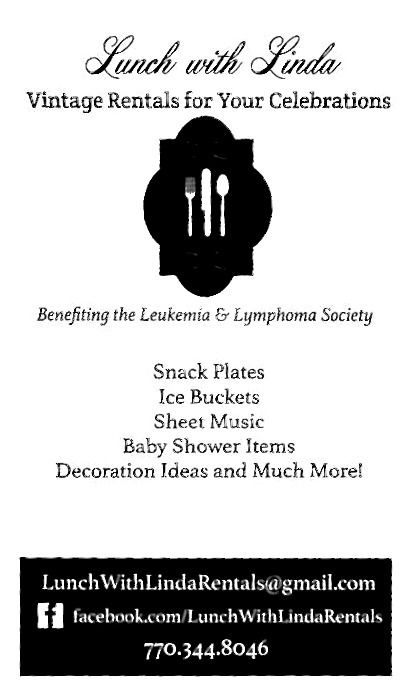 Then, out came our three-tiered tray bearing a variety of goodies. The scones were large, round, powdered-sugared and chocolate chippy, with a texture we both found interesting: flaky but light exterior, moist and light interior. Fabulous! There was also a cup of frozen fruit salad and some fresh fruit. The sandwiches were cucumber, pimiento cheese (with pretty stacked layers), bacon and tomato on pumpernickel, and chicken salad on croissants. All yummy, and not a soggy one in the bunch. Finally, dessert! We had brownies with fudge sauce and a cherry on top, what I believe were white chocolate covered cream puffs, strawberry mousse in tart shells, and my favorite, raspberry cheesecake topped with mini-white chocolate chips. You will not leave this place hungry! I asked if I could snap a few photos and our server told me to take all I wanted. 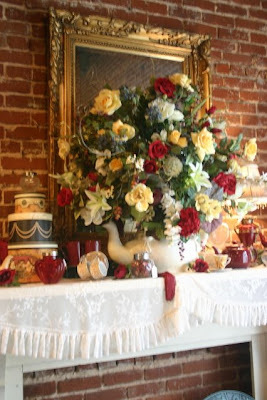 I liked this huge teapot bearing a floral arrangement on the mantel. There were about three other tables occupied while we were there, and everyone seemed to be enjoying themselves, from a table of ladies to a young couple with a very well-behaved little boy who sat next to us! The tearoom also had a very well-stocked gift shop, and I left with a rosy porcelain spoon, a necklace and earrings. Just doors away are more shops that might be of interest to tea-goers: a country store featuring primitives with a quilt section opening in early March, a consignment store, a used book store, and a store of country French antiques (named "Refind") that surely is one of the prettiest, most charming and elegant antique stores I've visited in quite a while. Of all the gifts my husband gives me, these Valentine's Day tea trips will always be my favorite! Steph of Steph's Cup of Tea! Since I have your address already, I'll get these notecards off to you! Congrats! 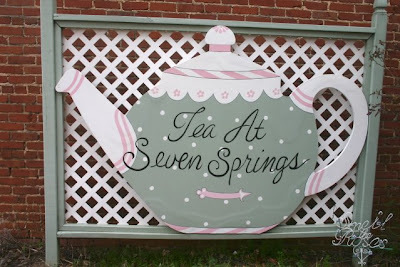 Want to win a Newnan tearoom cookbook? Let's end this week of giveaways with a really good one, shall we? In the mid-eighties, I was the guest of honor at a luncheon given by some co-workers at Something Special in Newnan. I absolutely adored the ladylike atmosphere, dining in a historic home among so many pretty things and enjoying wonderful homemade foods. 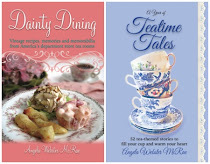 It would be years before I realized I had actually been in a real old-fashioned "tearoom," the sort of place that offered quiches and tea biscuits for lunch. By the time I fell in love with teatime, the owners had retired and moved away. Today, Something Special is still open to the public as a special events facility, but gone are the days of "ladies who lunch." 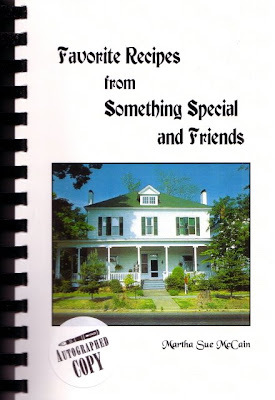 I did have the good sense to get a copy of the Something Special tearoom cookbook when it came out, and I treasure it as a memento from a beloved local establishment. The author and Something Special's proprietor, Martha Sue McCain, was back in Newnan Thursday to autograph her second printing of the book at Scott's Bookstore. 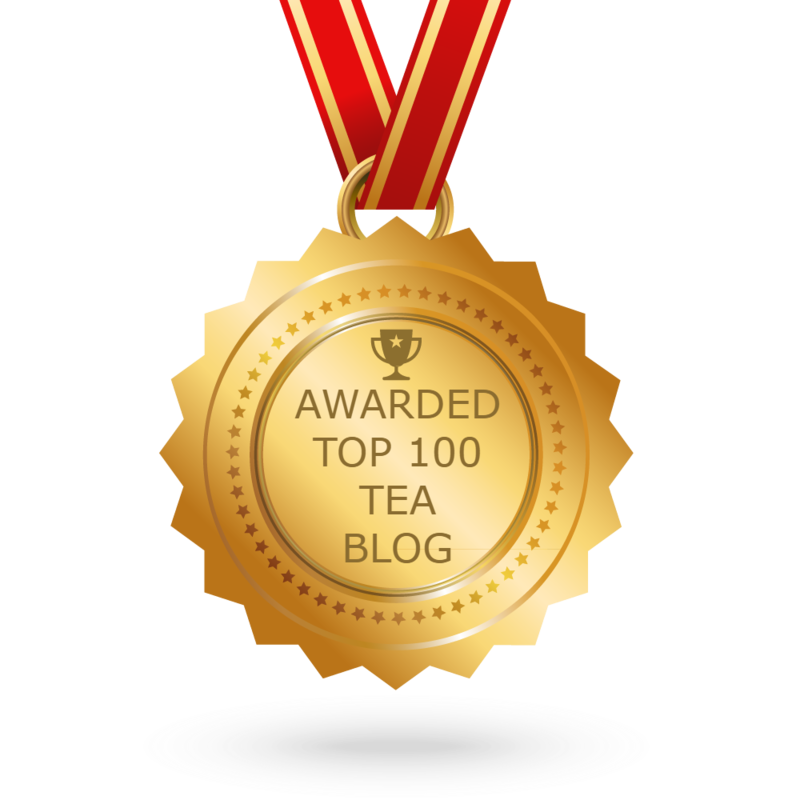 The new edition of the book includes a chapter on chocolate, and today I'm giving away a copy as a Valentine's Day gift and reminder that readers of this tea blog are very much LOVED and appreciated! (All those sweet comments? You ladies are such sweethearts!) To enter the giveaway, simply leave a comment to this post between now and 7 a.m. Monday. 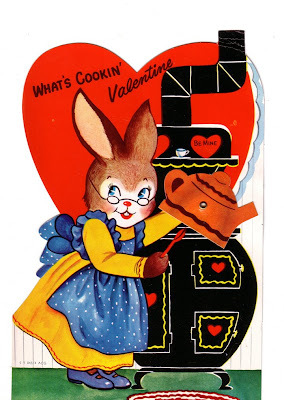 And Happy Valentine's Day, y'all! Ramen noodles. That's all I could think of when I opened this packet of tea from Upton Tea Company. The leaves tumbled out and looked just like curly dark green pieces of crumbled-up ramen noodles. You know, it's almost like opening a present each week to see what the tea-of-the-week is going to look like, and it is really quite fun to see the variations in appearance! Dry leaf appearance: "Ramen noodles" is what first came to mind, but then I remembered the English words from the Harney book, Spring Snail Shell, and thought, "Ah, yes! I see where they got that!" Wet leaf appearance: Pretty olive green, twig-looking leaves. Or maybe fat pine needles. Scent: At first I thought this tea smelled like steamed asparagus, but then I decided it was more like cauliflower. "Steamed vegetable" would be a safe bet. And interestingly, once I poured off the water and smelled the spent tea leaves, some very different characteristics emerged. First, it smelled like something roasted (vegetable, not meat). But when I came back to the leaves perhaps 30 minutes later, they had an almost citrus scent, and the roasted scent was completely gone. Flavor: This had a nice (what I've heard referred to as) "mouth feel," although there was a little of that puckery, astringent feel after I finished the cup. It was very pleasant to drink, though, so the aftertaste wasn't a dealbreaker for me at all. 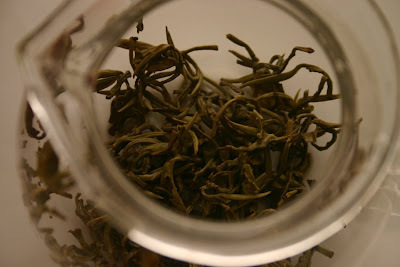 Additional notes: Again, I'm surprised at how much I'm enjoying these "pure" teas in their simple, un-tarted-up form. Very different from what I've always thought of as "green tea taste." Michael Harney's account of seeking out a Bi Lo Chun farm in China was one of my favorite chapters in the book so far. You cannot read this book without coming away with a much greater appreciation for tea! Leslie from Comfrey Cottages! 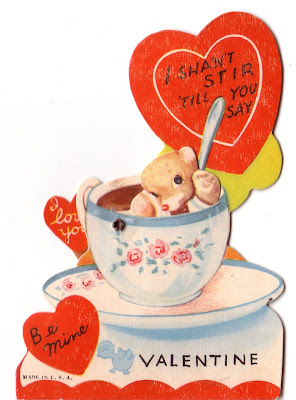 If you'll send your snail-mail address to angela@newnan.com, I'll get this bag of Valentine's teas right off to you. Congrats! My latest collecting craze? 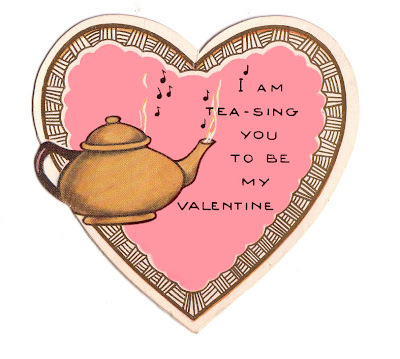 Vintage tea-themed Valentines. My fledgling collection was found through Ruby Lane Antiques, Etsy and eBay, ranging from about $2-5, which is a great "price point" for these pieces. Next year, when I have (hopefully!) acquired a few more, I plan to create a little vignette with them. Meanwhile, I am scanning these as I get them and plan to use them in making crafts. 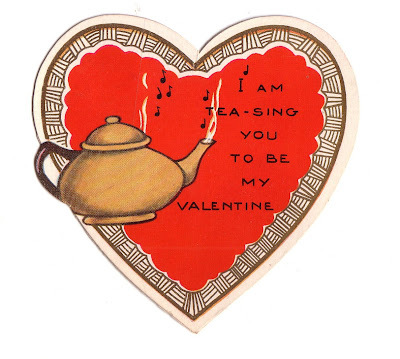 The heart-shaped "Tea-Sing" one was actually red when I bought it, but my sweet friend Deberah pinkened it for me in Photoshop so I could have it in a colorway I will actually use. I scanned all of these as high-res images, so if you want to download them to your computer for whatever use of your own, you certainly have my blessing to do so. Belinda! 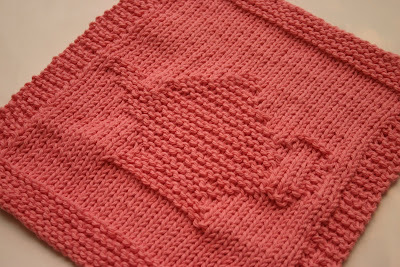 If you'll send your snail-mail address to angela@newnan.com, I'll get that teapot dishcloth in the mail to you. Congrats! 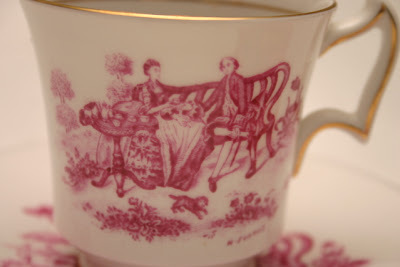 This Royal Chelsea "Tea Party" pattern cup and saucer is a favorite set I bought years ago on eBay, and I love everything about it: the name, the pink toile look, the shape of the handle, and most of all, the graphic of a couple enjoying an al fresco tea party. 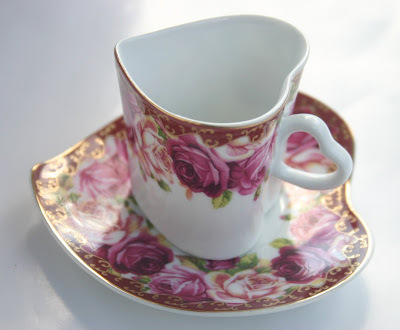 It's a perfect teacup to use during Valentine's Week, don't you think? 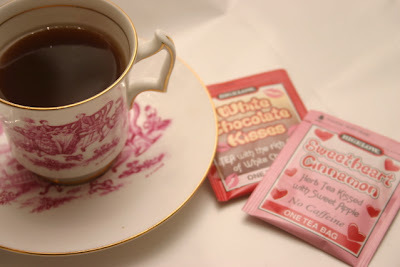 The Valentine's teas I ordered from Bigelow arrived this week, so I've been sampling White Chocolate Kisses and Sweetheart Cinnamon teas. To my great surprise, the Sweetheart Cinnamon is actually the one I like best, largely because of the apple flavor which gives it almost an apple cider taste. The chocolate tea actually has cocoa in it (which explains the powdery residue in the cup), making for a sort of hot chocolate/tea hybrid, which was interesting. 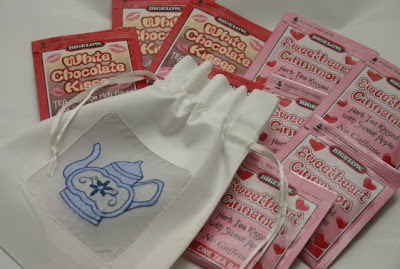 I tucked a sample of each tea into some Valentine cards I sent to friends, and I have some left over and will be sending this little teapot drawstring bag of 10 teabags (five of each flavor) to today's giveaway winner. 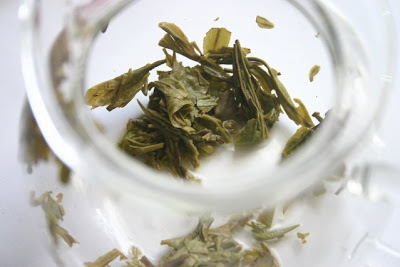 If you want to try these teas, just leave a comment on today's post! Good luck! Ginger! If you'll send your snail mail address to angela@newnan.com, I'll get "A Social History of Tea" in the mail to you! And since several of you asked about the pattern, I thought I'd let you know that heart-shaped tea set yesterday is unmarked except on the bottom of the box, which says Made in China. I didn't ask, but I would not at all be shocked to find my mother actually bought this months ago at a yard sale. At Christmas, I thought she had one of her greatest lines ever when she told everyone, "If you got something you didn't like, let me know and I'll see if I can remember what street I got it on so you can go back and exchange it." Karen: Great idea about decoupaging the hat box! Thanks! Have you ever used dishcloths knitted or crocheted from that Sugar 'n Cream yarn? I've been making them for years now, and my family and I just love them. They look a bit large when you first make them, but then after you use one a while and toss it in the washing machine and dryer, it shrinks a bit but then bounces right back to become a favorite dishcloth. I've made very plain, unadorned ones, but last night I made this one, and it is also going to serve as today's giveaway! 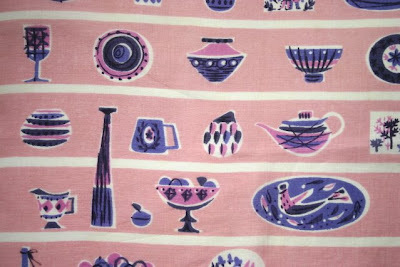 I found this great pattern here, courtesy of one Stephanie Haberman, who is apparently both talented *and* generous, since she has provided this pattern free of charge. It was very easy to make, even for a newbie knitter like myself. Loralie! If you'll send your snail mail address to angela@newnan.com, I'll get the tea-themed notepaper headed your way! Enjoy! 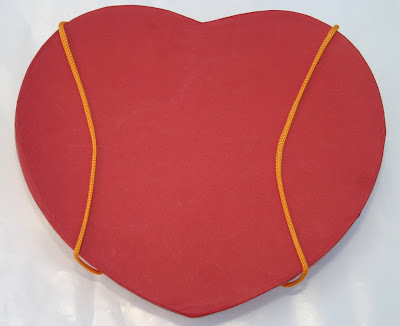 Ever seen a heart-shaped hatbox? I hadn't until I got this Valentine's gift from my mom! 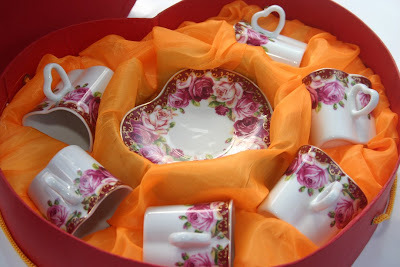 These cups and saucers are the small demitasse size, and with the heart-shaped saucers and the heart-shaped cups and handles, I think this is just one of the neatest Valentine's sets I could ever imagine. And now it's giveaway time. 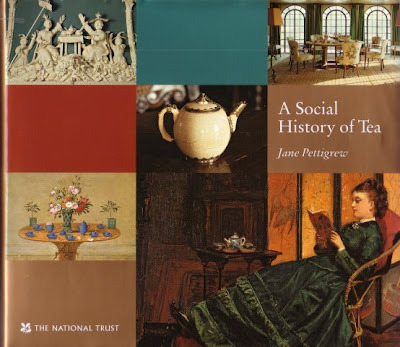 Today's giveaway is a copy of the perfectly wonderful book "A Social History of Tea" by Jane Pettigrew. I had a heck of a time finding a copy of my own when this came out, and paid something like $40 for it years ago. When I saw this one on the clearance rack at a local bookstore recently for just a few pennies, I had to get it to share with another tea lover. It's a hardback book with dust jacket, but the top cover of the book (which you can't even see since it's behind the dust jacket) has a slight "dent" in it, so this imperfection is why it was on clearance. 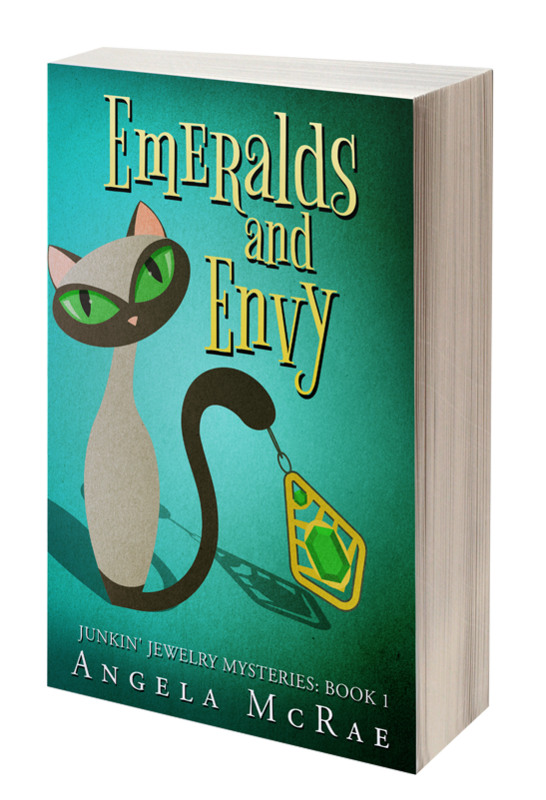 Other than that, it's a new, unread book, and I hope someone out there would like to have it. Just leave a comment between now and midnight and you'll be entered to win. There's no limit to the number of times you can win this week, so feel free to enter every day! This house knows tea - and celebrity! 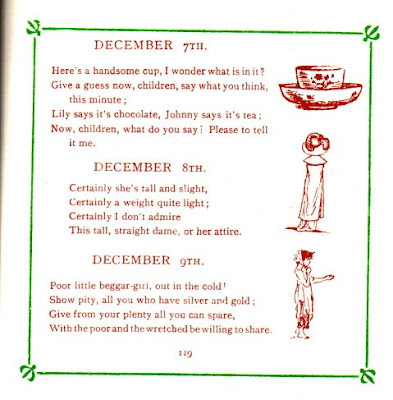 The gift of "English Tea Time"